Just before 4 am on August 31, 1888, on London’s seedy Buck’s Row, a cart driver named Charles Cross saw the body of a woman lying on the ground. In the early morning gloom, it was initially impossible to tell if she was drunk or dead. Cross was soon joined by another carter, Robert Paul. The two men saw the woman’s skirts were pulled above her waist. They smoothed them back over her knees and went searching for a policeman. 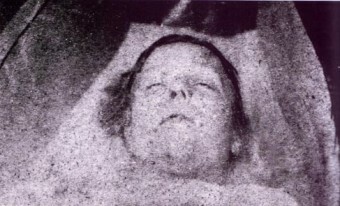 The victim was soon identified as Mary Ann “Polly” Nichols, a 44-year old alcoholic and prostitute. As noted, her throat had been cut ear-to-ear down to the vertebrae and the large blood vessels on both sides of her neck had been severed. There were also several very deep horizontal wounds on Polly’s lower abdomen, and three violent wounds running downwards as well. Nichols had last been seen by her friend Emily Holland around 2:30 a.m. She was off to raise the money needed to secure a bed in a lodging house and assured Holland she’d be back soon. Polly said that she’d already made the money she needed a few times over that evening, but drank her earnings instead of paying for a room. So Polly stumbled off into the night and her unhappy fate. On Buck’s Row, the killer, most likely posing as a customer, managed to clap a hand over Nichols’ mouth and slit her throat without a single person hearing, despite some workers in a building nearby. Even more incredibly, he had time to mutilate her and then slip silently into the night. So it was that London’s East End was put at the mercy of one of the most notorious serial killers in history – Jack the Ripper.